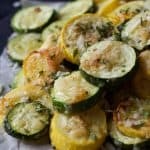 In a bowl add zucchini, squash, parmesan, olive oil, garlic powder, salt, and pepper. Toss with your hands to completely coat. Place zucchini and squash on a baking sheet in a single layer. Bake for 15-20 minutes until cheese is slightly browned.